Rose & Odin: Little Pincushion Swap. Sweet Little Pretties hosted a pincushion swap this past month and I joined in the fun. I had never made a pincushion before and I, myself, did not have one. I am currently using my grandmother's little magnetic canister that is stuffed with pins. My mother had the tomato pincushion with the dangling strawberry in her sewing room when I was growing up. I was very fascinated by it and wanted to eat the strawberry! Her collection of straight pins were dull, just the silver ones with little heads. I would get excited if a pearly one somehow found its way onto the cushion. I would insist she use it on the items she was sewing for me! The tomato pincushion with the dangling strawberry is long gone now. Just about anything will work to stick your pins in for safe keeping! 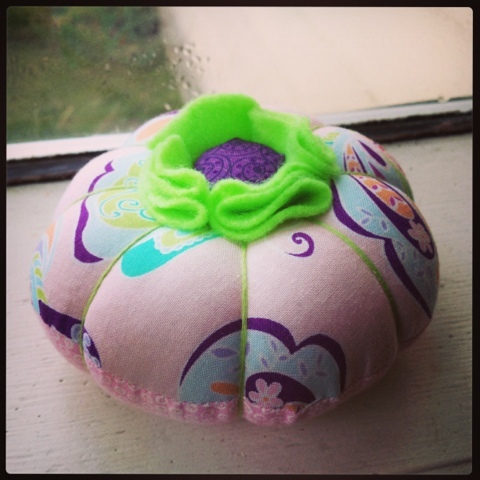 There are so many cute styles and creative designs for pincushion out there. My partner lives in the UK and said she is partial to pinks and purples. Luckily P is also fond of pinks and purples so there was a large variety in my scrap stash to choose from. I went with the round design that was was tufted with embroidery thread. I finished it off with some green felt and a purple covered button. I added a little purple flower button on the underside too. It's amazing how much stuffing can fit inside! You can view some of the pincushions being swapped on Instagram by using the hash tag #littlepincushionswap or visit the Sweet Little Pretties web page for the link ups and stories! Really cute! I like the touch of the felt flower in the middle. I currently use a tomato (LOL) so I can't wait to get my new pin cushion in the mail from my secret pin cushion designer!